The museum’s exhibitions explore fundamental American ideals and ideas—such as democracy, opportunity, and freedom—and major themes in American history and culture, from European contact in the Americas to the present day. At the heart of the museum is our deeply moving exhibition on our most iconic artifact, The Star-Spangled Banner, The Flag That Inspired the National Anthem. New West Wing exhibitions opened in 2017 include American Democracy: A Great Leap of Faith and Many Voices, One Nation, which ask visitors the question, “What kind of nation do we want to be?” Major exhibitions on innovation, money, and business history explore these topics from a range of perspectives and challenge visitors to consider what is distinctively American about them. The full reinvention of the West Wing will be completed in 2020 with the opening of new third floor exhibitions on entertainment, culture, and the arts. In our East Wing, landmark exhibitions include The Price of Freedom: Americans at War, which surveys the history of U.S. military conflicts and examines ways in which wars have been defining episodes in American history. America on the Move immerses visitors in the sights, sounds, and sensations of transportation in the United States from 1870 to the present. Familiar favorites on view include The American Presidency: A Glorious Burden, Within These Walls, and The First Ladies. Our popular exhibition on the transformation of American food featuring Julia Child’s kitchen will be refreshed in 2019. A new exhibition on the history of medicine will also open in 2019 exploring the ways Americans have struggled to control and contain disease, through prevention, diagnosis, and treatment. In 2020, as part of the Smithsonian’s American Women’s History Initiative, the museum will open a major temporary exhibition, which will then tour nationally. We complement these major exhibitions with an ongoing program of temporary exhibitions and object rotations and smaller displays to engage our visitors in the most important stories in American history. The museum welcomes visitors of all ages and abilities. Wegmans Wonderplace—the first exhibition on the National Mall for children age 0-6 and their adult companions—gives our youngest visitors a close-up view of real museum artifacts in a fun and age-appropriate learning environment. Draper Spark!Lab and Patrick F. Taylor Foundation Object Project offer a wealth of opportunities for older kids to get their hands on history. We offer audio tours for adults, families, and preschoolers, and highlights guides to the collection in 8 different languages. Visitors to the museum enjoy public programs that help connect them to the rich and diverse stories of our nation’s past. The museum’s award-winning History Alive program uses lively theater programs to connect our visitors to the choices and challenges faced by Americans in previous generations. Dynamic food programs take place in our state-of-the-art demonstration kitchen in the Wallace H. Coulter Performance Plaza, featuring historians and chefs who tell stories through flavor and scent. A dedicated and dynamic staff of facilitators and docents lead visitors on tours, run interactive touch carts, and get visitors talking to each other in Wallace H. Coulter Unity Square. Our Warner Bros. Theater hosts world-class film programming with a regular schedule of engaging documentaries and first-run movies. And special lectures, parties, and festivals throughout the year welcome local and national audiences to the museum. The museum reaches outside our walls to bring history to people across America, both physically and digitally. Our blog, O Say Can You See, offers new perspectives on the most interesting stories and artifacts in American History. In 2019, the Smithsonian Jazz Masterworks Orchestra will launch a worldwide tour, bringing America’s original art form to audiences from Houston to Beijing. Our What It Means to Be American project has taken us from Honolulu to London to explore big questions about American history and identity through events and publishing. Our Let’s Do History Tour provides top-quality, free professional development training to thousands of K-12 teachers across the country, and introduces them to the wealth of free standards-based history resources available at the Smithsonian’s History Explorer. In addition to helping you plan your visit, our website offers exhibitions and behind the scenes glimpses into our collections. On social media, the museum hosts an ongoing conversation where people across the world can encounter our collections, connect with us and with each other, and be inspired, surprised, challenged, moved, and engaged. More than ever before, the National Museum of American History shines new light on the transformative power of American history. Our collections, exhibitions, research, publications, and educational programs all support the museum’s basic mission—to use the infinite richness of American history to help people make sense of the present and shape a more humane future—and to make our exhibitions and programs as accessible as possible and engaging to all visitors. 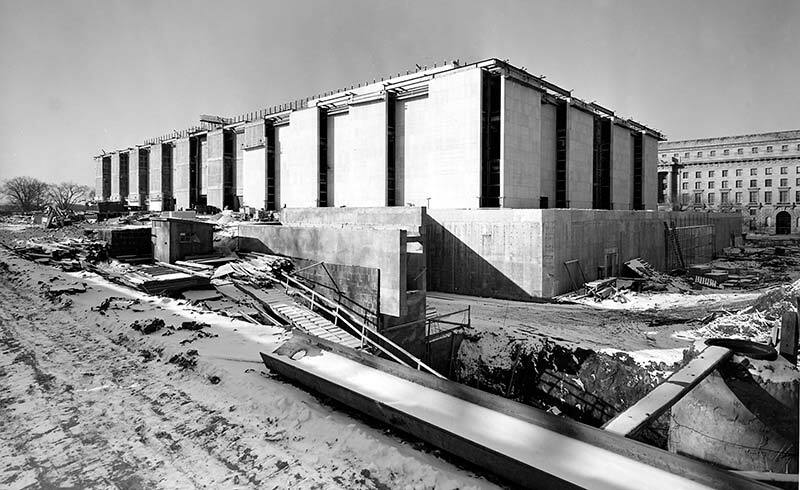 Construction of the National Museum of American History began in the late 1950s. The National Museum of American History opened to the public in January 1964 as the Museum of History and Technology. It was the sixth Smithsonian building on the National Mall in Washington, D.C. Since then, some 4 million visitors a year have passed through the doors to enjoy the museum’s exhibitions, public programs, educational activities, collections, and research facilities. Millions more make virtual visits to the museum’s website. On June 28, 1955, President Dwight D. Eisenhower signed the bill authorizing $36 million for the museum. Groundbreaking took place on August 22, 1958. The architects were McKim, Mead and White (succeeded in 1961 by Steinman, Cain and White). Mills, Petticord and Mills were associate and supervising architects and engineers. The museum’s area is approximately 750,000 square feet, including a basement, three main exhibition levels, two office-collection levels, and a mechanical penthouse on the roof. The building’s location on the National Mall qualifies it as a National Historic Landmark. Its status as one of the last structures designed by the renowned architectural firm of McKim, Mead and White, along with its location, makes it eligible for listing on the National Register of Historic Places. In 1980, the museum’s name was changed to the National Museum of American History to better represent its basic mission—the collection, care, and study of objects that reflect the experience of the American people. In 2008, the museum completed a two-year, $85 million renovation of the building’s center core, dramatically transforming the building’s architectural appeal while reorganizing and renewing the presentation of its extensive collections. The renovation project focused on three areas: architectural enhancements to the center core, including a grand staircase and a skylight; construction of a new Star-Spangled Banner gallery, and updates to the 44-year-old building’s infrastructure. Currently, the transformation of the museum is continuing with a major project to renew the building’s 120,000-square-foot west exhibition wing. Learn more about the museum's history from the Smithsonian Institution Archives.